Back in the days of Mac OS 8 and Mac OS 9, we used ResEdit to edit resource files to modify application resources. Unfortunately, ResEdit was never updated for Mac OS X. This isn’t too much of a problem in itself, because most OS X apps do not use resource files. A few programs have come and gone, but none have ever replaced nor had the same level of functionality as ResEdit did. 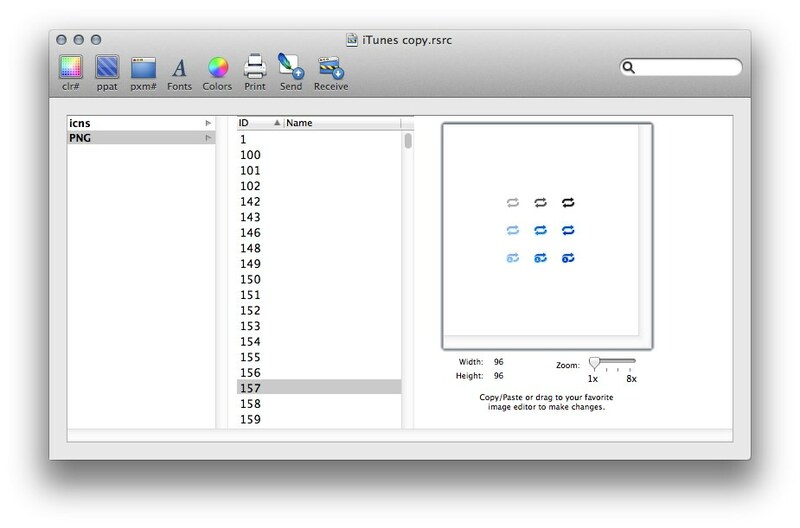 There are a few apps that still use resource files as container files for other file types, one such app is iTunes. Even the latest version uses a .rsrc file to store most of the PNG images which create its user interface. ThemePark 3, an application that lets you modify the appearance of OS X, still works on the latest version of Mac OS X (Mountain Lion 10.8) and opens .rsrc files without any problems, allowing you to see the contents and replace them. ThemePark 3 is a little buggy on later versions of OS X, and sometimes it’s necessary to resize the window to force the app to redraw the window contents. ThemePark allows you to open .rsrc files, and send/retrieve the PNG graphics to/from Photoshop for easy editing and replacement of PNG graphics. Working on a copy of iTunes.rsrc to edit iTunes UI elements using ThemePark 3.